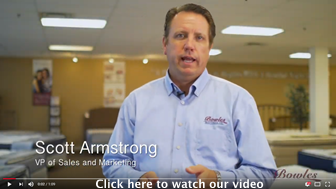 Click the image above to review an introductory video to Bowles Mattress. Additional informational videos can be found throughout the website. Thank you for making our family company an American favorite since 1975 throughout Indiana & Kentucky! Bowles distributes mattresses within a 200-mile radius of our factory in Jeffersonville, Indiana. Review the Where to Buy section to locate a Bowles Retailer near you. Stores are designated by the number of mattress models displayed on their showroom floor. When searching for a specific mattress model or series, please contact the store to ensure it is on display for you to see. Click here for a GOOGLE MAP of our retailers.